2016 Sustainable Destinations Top 100. Many Thanks to Andrew Donaldson for his work on our nomination and now recognition – Another great accolade for the village ! Scottish eco-destination Comrie is proud to announce that it has been chosen as one of the 2016 Sustainable Destinations Top 100, compiled by Travel Mole’s ‘Green Destinations’. The only Scottish destination in the list and just one of four UK destinations, Comrie is flying the green flag for sustainable tourism and in the Top 100 sits alongside fellow leading green destinations around the world including the Grand Canyon, Yellowstone and the Kingdom of Bhutan. The competition for the 2016 Sustainable Destinations Top 100 was launched at ITB Berlin by Travel Mole’s Vision on Sustainable Tourism: ‘Green Destinations’, the Destination Stewardship Center and QualityCoast. 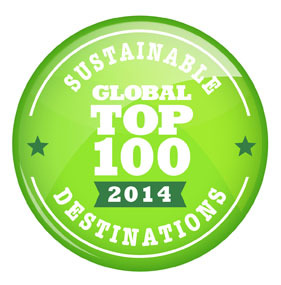 The 2016 Sustainable Destinations Top 100 overall theme is “Destinations of Future Generations”. Shortlisted destinations must cherish and celebrate their authenticity, their biodiversity and nature, their cultural values, the local community and entrepreneurs, and their environment, for future generations of citizens and travellers. Comrie’s Green Destinations ambassador Andrew Donaldson, commented, “Comrie is a wonderful place on the edge of the Scottish Highlands. Within this stunning landscape, local people are forging ahead with innovative projects such as transformation of the former WW2 Cultybraggan Prisoner of War Camp into a world leading example of green heritage development with allotments, a community orchard, living history, sports facilities and business units. Green businesses such as Comrie Croft demonstrate how enterprising and creative people can bring about environmental and community regeneration. Perhaps most importantly, the strength of the community is our most cherished asset. There are over 70 voluntary groups in the village doing everything from weekly lunches in the community centre to cultivating flower tubs and hanging baskets. We love this place and the community so much so we take great care to look after it now and for future generations. Green Destinations and media partners will announce the full list of Top 100 destinations live at Global Green Destinations Day in the EU Green Capital 2016, Ljubljana, Slovenia on September 27th. Andrew used this video put together by our Strathearn Snapper Lynn McGregor and photos by our eye in the sky Mark Nesbitt as part of the application which led to this wonderful accolade Isn’t it great to have so many talented people promoting our wee village ? Thank you Folks !!! Green Destinations provides a new global platform for ambitious destinations eager to improve their quality and sustainability, from their own strengths. With our Global Sustainable Tourism Review (GSTR), we combine and connect the tools created by a.o. the Global Sustainable Tourism Council (GSTC), QualityCoast, Quality-Destination. In international partnerships we cooperate with key players like DestiNet, ECOTRANS, TUI (NL), BookDifferent, and many more, looking to make a difference. Comrie Croft, established in 2005, is already known as a green haven to escape to for a weekend’s camping, mountain biking or as an alternative wedding venue. But what many people don’t realise is that the Croft was set up with a bigger purpose in mind: to showcase the potential of rural places to fulfil the needs of people for food, habitation, enterprise, recreation, community and creativity while encouraging the natural world to flourish too. This includes the recently launched 100 Mile Store, Tomnah’s Market Garden and The Tea Garden Café.